At 12:30 p.m. local time on Thursday, the final table of the 2015 PokerStars.com European Poker Tour Season 12 Prague €50,000 Super High Roller began, filled with some of the biggest names in poker. After 156 hands of play, none other than Steve O'Dwyer came out on top. 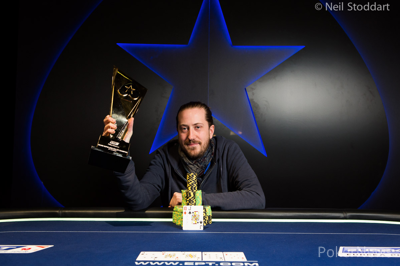 After having won the first Super High Roller of 2015 at the PokerStars Caribbean Adventure back in January, he has now won the last EPT Super High Roller of the year in Prague. John Juanda, EPT Barcelona Main Event champion and recent Poker Hall of Fame inductee, was the first one to get eliminated. He found himself short and pushed from the button when the action folded to him. Austrian pro Thomas Muehloecker, who was in the big blind, woke up with ace-king and beat out Juanda's jack-nine. A king on the flop left Juanda drawing slim, and he was dead on the turn. Dzmitry Urbanovich then started gathering more and more chips, and Daniel Dvoress doubled through Sam Greenwood. But, it was Luuk Gieles who would suffer the most in the period following Juanda's elimination. Gieles first doubled Greenwood in a preflop all-in situation with nines versus Greenwood's ace-king. An ace on the flop, and river, resulted in a a much shorter stack for Gieles. An ace-high flush for Igor Kurganov versus Gieles' king-high flush did even more damage later, and the Dutchman was left with just four big blinds. Gieles busted not much later when he failed to improve with jack-nine suited against Muehloecker's kings. 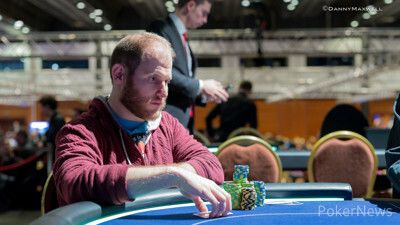 With Gieles' elimination, the start-of-day chip leader was out in seventh place and had to settle for €137,140. Dvoress was next to go. Action had folded to Greenwood in the small blind, and he pushed all in. Dvoress called with ace-ten suited from the big blind, but failed to improve to beat out Greenwood's aces. The ten on the turn wasn't enough to save Dvoress' tournament life. While Urbanovich continued to crush and his wall of chips grew, Muehloecker's stack was doing the exact opposite. Muehloecker then decided to make his move with pocket sixes and got called in two spots, by Urbanovich and Kurganov. The hand was checked down by the two active players, and Muehloecker's sixes were beaten by Kurganov's flopped pair of jacks with jack-ten, resulting in a spot on the rail for Muehloecker and €220,500 in his pocket. In the levels that followed, Urbanovich couldn't hold on to his chips. The Polish poker prodigy first doubled up Greenwood in a thriller of a hand. Urbanovich had ace-king and was up against pocket sixes. He flopped a king, turned an ace, but was crushed by the six on the river that gave Greenwood the double up. Urbanovich was left with just 14 big blinds and moved in with king-queen suited from first position not much later. Urbanovich got called by O'Dwyer with ace-seven suited and the Polish pro didn't hit, sending him home in fourth for €285,000. Kurganov had taken the chip lead not too long before that, but doubled O'Dwyer in a huge preflop all-in hand with ace-jack against ace-queen. O'Dwyer, holding ace-queen, hit a queen and rivered a flush to take most of Kurganov's chips. Kurganov had the lesser hand there, but he would get his last chips in dominating O'Dwyer with ace-jack against king-jack for 22 big blinds each. O'Dwyer hit a king on the flop to send Kurganov home in third place for €376,400. Sam Greenwood (41 big blinds) and O'Dwyer (98 big binds) went on a 75-minute dinner break and came back having discussed a deal. With just €22,315 to play for, O'Dwyer was guaranteed the biggest winner of the tournament already with €724,228 locked up. Greenwood was guaranteed €643,607. The heads-up match didn't last too long, with O'Dwyer eventually getting the better of Greenwood in a big hand. Greenwood pushed the action with an open-ended straight draw and ended up pushing all in after having missed on the river. O'Dwyer called with second pair, mediocre kicker, and soon he found himself posing for photos with his jack-ten off suit, giving interviews with the trophy on his side. 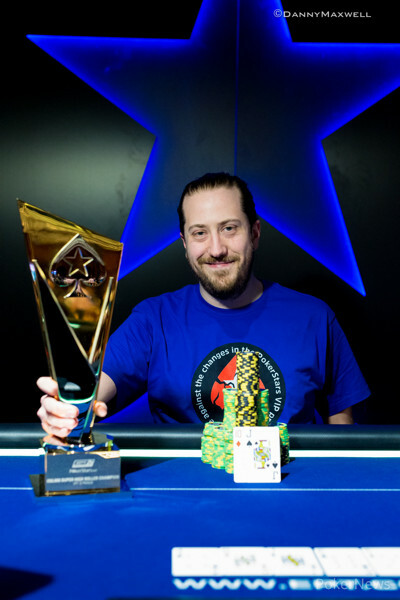 With his first-place prize, not only did O'Dwyer win €746,543 and the trophy, he also moved 280.55 points closer in the race for the Global Poker Index Player of the Year title, overtaking Nick Petrangelo and getting him close to Anthony Zinno and Byron Kaverman. That wraps up the PokerNews coverage of the 2015 EPT Prague €50,000 Super High Roller, but we've got plenty more on there docket in the coming days, so stay tuned. Hand #156: Sam Greenwood raised from the button to 300,000 and Steve O'Dwyer three-bet to 900,000. Greenwood called and the flop brought out on which both players checked. The turn was the and O'Dwyer checked again after which Greenwood bet 830,000. O'Dwyer made the call and on the river the hit. O'Dwyer checked a third time and Greenwood decided to go all in for 3,165,000. After a while O'Dwyer called, and Greenwood showed his for a complete bluff. O'Dwyer showed and his second pair was enough to send his one remaining opponent to the rail. With finishing second in this event Greenwood locked up the biggest live tournament result of his career, bumping him from 41st on the Canadian all-time money list to 21nd. Hand #152: Sam Greenwood raised from the button to 300,000 and Steve O'Dwyer three-bet from the big blind to 900,000. Greenwood folded. Hand #153: Steve O'Dwyer limped on the button and Sam Greenwood checked. The flop brought out and Greenwood check-called 150,000. On the turn the hit and both players checked. The river was the and O'Dwyer checked behind, after which Greenwood smiled as he tabled . O'Dwyer mucked and Greenwood took down the pot. Hand #154: Sam Greenwood raised from the button to 300,000 and Steve O'Dwyer called from the big blind. The flop brought out and Greenwood picked up the pot after betting 280,000. Hand #155: Steve O'Dwyer raised to 155,000 and picked up the pot. Hand #142: While the blinds had just gone up, Steve O'Dwyer made it 230,000 and wasn't corrected. Sam Greenwood made the call, but check-folded on to O'Dwyer's 150,000 bet. Hand #143: Greenwood made it 225,000 from the button and O'Dwyer called. The flop came and O'Dwyer check called a bet of 215,000. He check called another 600,000 on the turn and they both checked the on the river. "KIng high!" O'Dwyer exclaimed, but it was no good as Greenwood showed his . Hand #144: O'Dwyer made it 230,000 to go and Greenwood folded. Hand #145: Greenwood opened for 300,000 and O'Dwyer made the call. Both players checked the flop and the on the turn was seen at no additional fee. O'Dwyer bet out 375,000 and Greenwood called. The fell on the river and both players checked. Greenwood showed and O'Dwyer mucked. Hand #146: O'Dwyer made it 280,000 and Greenwood folded. Hand #147: Greenwood limped in and O'Dwyer checked. O'Dwyer then check folded to Greenwood's 160,000 bet on . Hand #148: O'Dwyer limped in and Greenwood checked. The flop came and Greenwood check called a bet of 150,000. The turn came the and now Greenwood check folded to O'Dwyer's 330,000 bet. Hand #149: O'Dwyer gave Greenwood a walk. Hand #150: Greenwood made it 300,000 and O'Dwyer folded. Hand #151: O'Dwyer opened for 280,000 and Greenwood called. Both players checked the flop and the hit the turn. Greenwood checked and O'Dwyer bet 275,000. Greenwood then check raised to 715,000 and O'Dwyer said "You got it" after just a couple of seconds in the tank. Hand #138: On the first hand of heads-up play Steve O'Dwyer raised to 230,000 and Sam Greenwood called from the big blind. The flop came down and both players checked. On the turn the action got checked again, and the river brought the . Greenwood lead out for 240,000 and he took down the first pot. Hand #139: Sam Greenwood raised from the button to 225,000 and Steve O'Dwyer called from the big blind. The flop came down and O'Dwyer check-called 310,000. On the turn the hit and both players checked. The river brought the and O'Dwyer lead out for what looked like 1.2 million, and Greenwood folded before O'Dwyer released the bet. Hand #140: Steve O'Dwyer raised from the button to 230,000 and Sam Greenwood called from the big blind. The flop came down and Greenwood check-folded. Hand #141: Sam Greenwood raised to 225,000 and Steve O'Dwyer three-bet to 675,000. Greenwood tanked for a bit before moving all in, and O'Dwyer folded right away. With 8 minutes remaining in the 50,000/100,000 level, play is underway. While on dinner break, Steve O'Dwyer and Sam Greenwood have worked out a deal. Steve O'Dwyer is guaranteed the biggest winner this tournament as he has €724,228 locked up right now. Sam Greenwood is guaranteed €643,607 right now. The two play it out for €22,315, the throphy and GPI POY points. Rich Ryan and Donnie Peters discuss Wednesday's RAWA hearing and the latest PokerStars press release, and Daniel Weinman joins the program to talk about his first big win, OFC with Michael Jordan and John Smoltz, and much more. Who Will Win the EPT Prague Super High Roller?